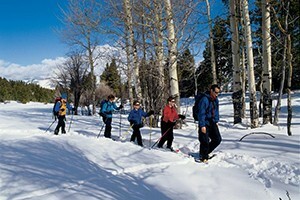 Snowshoeing is a peaceful way to enjoy snow covered trails and backcountry areas of Yellowstone in the winter. Rent a pair of snowshoes from the Bear Dens at Old Faithful or Mammoth and venture out on your own, join a ranger led snowshoe hike, or book a guided snowshoe tour. 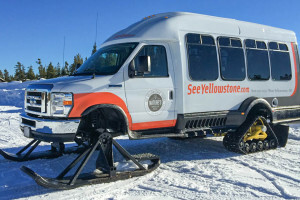 Offering unique snowshoe and SUV road-based tours in the park to see and hear winter wildlife, water features and hot springs. This is a great bucket list attraction. 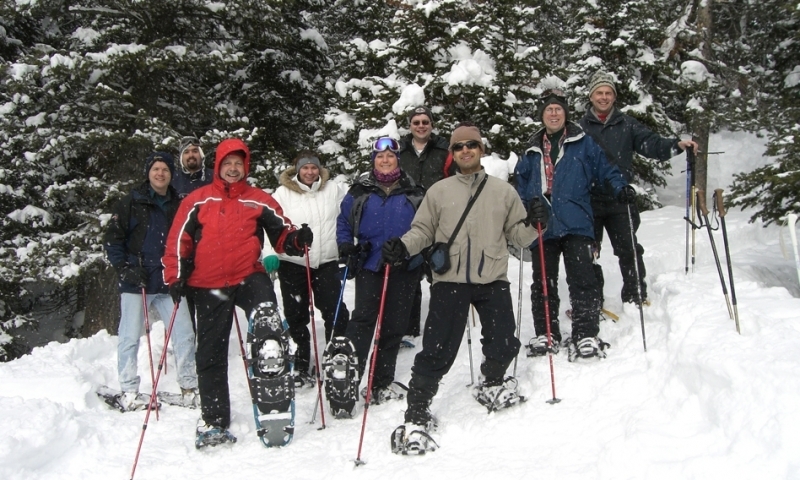 Bundle up and explore the snowy wonderland with a guided snowshoe tour..We have all the rental gear you'll need - you just bring your sense of adventure. Snowshoe and ski trips inside Yellowstone Park, complete with in-park lodging choices. This truly is the best time of year to experience the Park's splendor. 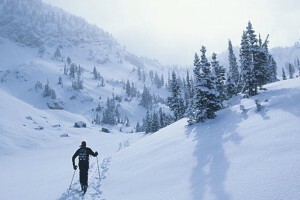 Join us for a unique adventure: explore Yellowstone's winter wonderland on snowshoes. Watch wildlife, find animal tracks, listen for a wolf's howl. Half-day in length. 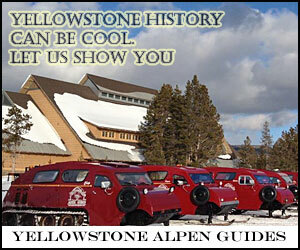 Where can I go snowshoeing within Yellowstone National Park? The West Entrance, located at West Yellowstone Montana, is one of two park entrances open during the winter months. The West Entrance is open to over-snow vehicles only (like snowmobiles and snowcoaches). You can also explore a number of cross country ski and snowshoe trails right from town. Download Map. Riverside Trail: Accessible right from town along Boundary Street, follow the Riverside Trail 1 mile in until it splits off on a few different trails. The Downriver Loop (North) has a short (2.3 mile) and long (3.5 mile) option, while the Upriver Loop (South) is 1.5 miles. As you drive north from West Yellowstone toward Big Sky you'll notice a number of trailheads on the east side of the road. Most of these access the northwest corner of the park and are great for snowshoeing. Download Map. Gneiss Creek Trail: You can shuttle a car here or do this trail as an out and back. Start at the trailhead 9.5 miles north of West Yellowstone and snowshoe up to 14 miles back towards West Yellowstone. Speciman Creek Trail: Further north of West Yellowstone, look for the trailhead on the east side of the road and follow this trail up to 8 miles along Speciman Creek to Shelf Lake. As the only entrance that is open to vehicles during the winter, Mammoth is a great place to enjoy a number of winter activities. 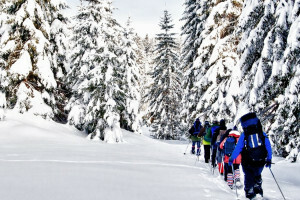 Ranger Led Snowshoe Walks are available here as well. Upper Terrace Loop: Snowshoe along the Uppper Terrace Loop in Mammoth Hot Springs for great views of geothermal features in the winter. Download Map. Old Faithful is only accessible in the winter months via snowmobile or snowcoach tour. But once you are here you can enjoy cross country skiing, snowshoeing, lodging, dining, and more. Observation Point: From the Old Faithful Geyser follow the trail all the way to Observation Point for great views overlooking the basin. Download Map. Where can I rent snowshoes within the park? The Bear Den has two locations within the park that rent snowshoes in the winter months, located at Mammoth Hot Springs and Old Faithful Snow Lodge (only accessible via snowmobile or snowcoach tour). Reservations for snowshoes are not necessary. Snowshoe rentals are also available in nearby towns, including Gardiner (just north of Mammoth Hot Springs) and West Yellowstone (at the West Entrance). You bet! Either join a Ranger Led Snowshoe Walk or take an entire day to explore Yellowstone on a guided tour (see the businesses listed on this page).